Today’s Flash Back Friday comes from Episode 227, originally published in December 2015. Rock was recognized for his business leadership when he took 1st Place for Business Excellence and Professionalism, by the Montreal Chamber of Commerce in 2005. It wasn’t always that way. Despite initial financial success, Rock Thomas knew there was something missing from his life that money wasn’t filling. So he embarked on a quest for knowledge. For four years, he traveled the world, investing hundreds of thousands of dollars in personal development and success training. He studied one-on-one with only the finest teachers, including Deepak Chopra, John Gray, David Deida, David Wolf, Anthony Robbins, Jack Canfield, and Wayne Dyer, Steven Covey, just to name a few. 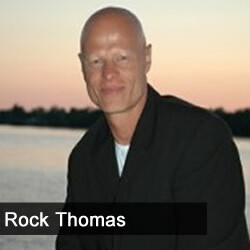 Make no mistake, Rock Thomas didn’t just gather success systems, self-actualization techniques and life strategies, he assimilated the information, processed the techniques and brings together the best of the best. The resulting speeches and seminars are a synergy of years of non-stop learning, combined with Rock’s own cutting-edge success formula.